Check Rates & Availability at Quality Inn Scottsboro! 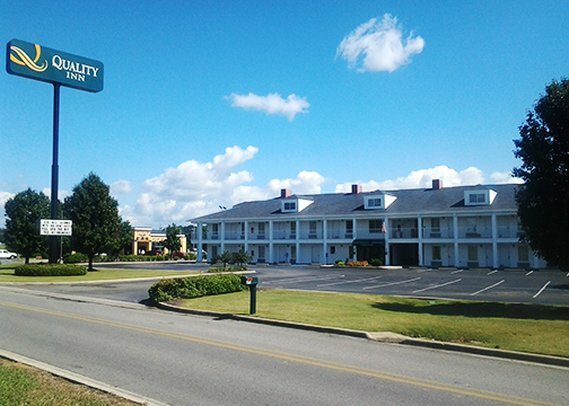 Get more for your money at the Quality Inn hotel in Scottsboro, AL, where you can relax and focus on reason you are traveling. Our hotel is located in the foothills of the Appalachian Mountains near Lake Guntersville. In addition to our professional, responsive and friendly service, we offer great complimentary amenities like free WiFi and hot breakfast. Perfect for corporate travelers, we also have copy, print and fax machines. When you are ready to settle in for the night, enjoy a relaxing guest room that features premium bedding, a TV, refrigerator, microwave, pillow-top mattress and hair dryer. Also, earn rewards including free nights and gift cards with our Choice Privileges Rewards program. The pet accommodation is 20.00 USD per pet per night. The size limit maximum is 25 pounds per pet and with a limit of 2 pets per room.. Swimming pool is OPEN for the season.